Here we all are, finding ourselves in the midst of another Lenten Season. We have again taken up the Christian warfare against sin in and around us. And after a week or so of adjusting to the tone of penance that is reflected in things around us, how are we faring? If we are fasting, even a little bit, we feel it. If we are trying to be silent and pray, we feel the effort of it. If we are giving alms… well, at least our pocketbook feels it! And if we are more attentive to controlling our will and whims, being more kind and patient with our neighbor, living in God’s presence and sensing that He truly is attentively watching us in our endeavors to be good… we do feel it. Even the cold of late and seemingly endless winter gives us another thing to offer lovingly to God as penance for our sins. For sinners we are, and our union with the merciful Redemptive Suffering on Calvary is our “ticket home”! In past years, our Lenten newsletters spoke encouragingly of keeping this holy season, not as a dismal and gloomy drudge to get through, but as a healing, joyful and liberating effort for love of God – and for conversion. Let’s realize it for once and for all: Lent is not about us, but about the good God and “His unspeakable gift” of grace and redemption. There is nothing picturesque about penance… In deciding to undertake a way of penance a man must know that he is leaving glamor behind him, that his motive must be to please God, that he will be called upon to bear crosses of a quite different shape from those he bargained for, and that the really effective part of it will be not what he does in the way of self-denial but what God does in the way of reproducing the Passion in the setting of his everyday life. Thus the introduction to penance is to be severely objective, realist, unemotional… True penance is self-forgetting in the further effort to remember only God…. There is only one approach to penance, and that is the way of complete surrender to the will of God. The Saints are in Heaven, this is certain; have we read of any who got there by living luxuriously on earth? Daughters, if only you knew what harm there is in this! While the body grows sturdy, the soul becomes so enfeebled that, if we saw it, we should fancy it was about to become extinct. Many books warn us of the injury done us by finding our peace in bodily comfort. It is impossible to engage in spiritual conflict, without the previous subjugation of the appetite. Fasting is the support of our soul: it gives us wings to ascend on high, and to enjoy the highest contemplation! 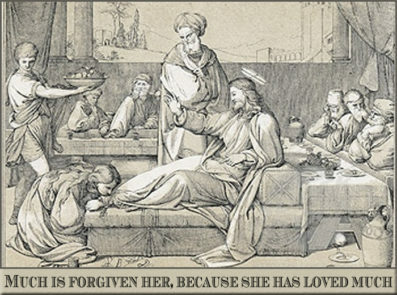 … God, like an indulgent father, offers us a cure by fasting. …True penance and the grace of conversion are the greatest grace and mercy that could be received in this life, for… it is a greater grace for God to draw a man from sin and place him in the state of grace than to bring him from grace to glory… Moreover… true penance, which is the principle of our resurrection, brings with it a new knowledge of spiritual things toward which man was formerly blind and a new love of God which is the form of true penance. Now all discipline seems for the present to be a matter not for joy but for grief; but afterwards it yields the most peaceful fruit of justice to those who have been exercised by it. Therefore, brace up the hands that hang down, and the tottering knees, and make straight paths for your feet; that no one who is lame may go out of the way, but rather be healed. The season of Lent prepares us to celebrate the great anniversaries of our redemption. May we all come to that holiest of weeks, liberated from sinful burdens, purified, free – to give all our heart, mind and soul to the grateful contemplation of Our Savior’s “unspeakable gift”. See our past newsletters: A prayerful Lent, Lent in Secret, Christmas in Lent, and Lenten Devotions and St. Joseph to read more about his holy season. Our website apostolate focuses in large part on the promotion of sacramentals, which are and have been important and useful aids in the spiritual life of all Catholics – and many who are not Catholic! 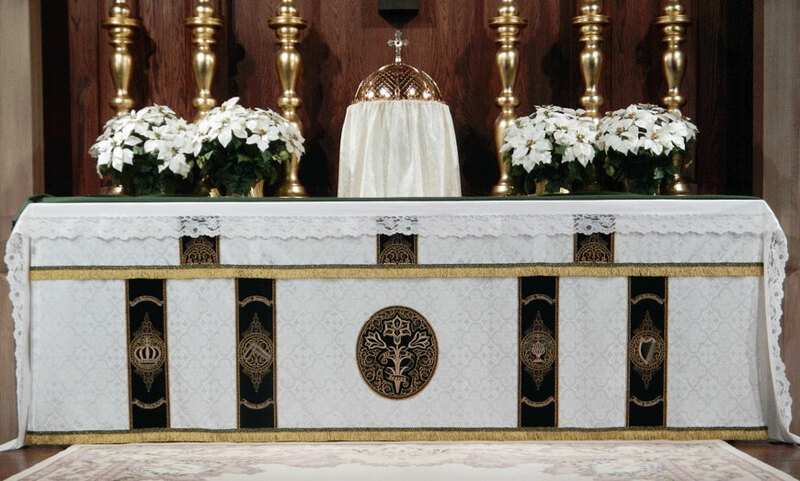 Since one of the most frequent requests we receive for topics for our newsletter is sacramentals and traditional Catholic devotions, we’ve decided that for this and all future newsletters, we would explain, briefly, the history and purpose behind some of the most “famous” sacramentals of the Church. It will be fascinating and edifying to learn more about these treasured conveyors of grace! For this newsletter, we would like to talk about two in particular: the ancient St. Benedict Medal (possibly originating in the 13th century) and the beautiful sacramental of Holy Water. Lent, the time of spiritual warfare against ourselves and the devil, could not be a more perfect time to talk about the St. Benedict medal. As the Cross of Our Lord Jesus Christ was the chief object of devotion among the first Christians, so it was also with St. Benedict (5th c.). It was this devotion to the Cross, the sign of our redemption, that gave rise to the Medal of St. Benedict, for devotion to this medal is, above all, devotion to the sign of our salvation. It is the only medal in the Church that is blessed with a special exorcism. Thus it is well known for its power against the evil spirit, temptations, and its efficacy in healing mental and bodily sufferings. Countless conversions have been wrought through the use of this medal. It has been devoutly used for centuries – in war, pestilence, natural disasters, and accidents of all kinds. Catholics wear it around the neck, attach it to their scapular or rosary, and often place it in the foundations of their buildings or above the doors in their house. We should take a moment to remember that the use of this Medal (or any sacramental) has nothing to do with the pagan practice of amulets and good luck charms. The graces and favors bestowed are the fruit of the faith in Christ Crucified, of (in this case) the powerful intercession of St. Benedict and of the blessings which Holy Church gives to the medal and those who wear it. The medal must be blessed! Only then can one benefit from the special blessings and exorcisms bestowed to the medal by the Church. The Front side of the medal shows St. Benedict, holding his Holy Rule. The reverse side of the medal is much more cryptic, showing a large cross and many series of letters. These letters are abbreviations for short prayers, many of which may have been frequently used by St. Benedict himself. A wonderful book about this powerful sacramental is The Medal or Cross of St. Benedict by renowned Dom Gueranger, O.S.B. The book includes an entire chapter of stories that tell of the wonders worked through this great sacramental of the Church. See also our new St. Benedict Medal page to learn more. With every order for a St. Benedict Medal, we also send an explanation leaflet which describes the medal in more detail and tells of its use. Having always wanted to offer suitable and attractive holy water fonts on our website, we were very happy to come across these beautifully handmade fonts. Since the very beginning of our rosary-making, we have offered gold-filled medals, crucifixes. And in 2002, when we started our website, we added individual medals and “jewelry” type crucifixes. 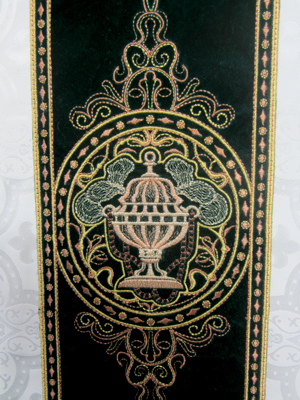 Recently, our main manufacturer for these beautiful pieces decided to increase the gold content in their gold-filled products. Due to the fluctuating economy and the current stable price of gold, they have changed their medals from 12KT gold filled to 14KT gold filled, which they describe as having “the look and feel of 14KT gold for a fraction of the price.” This explains why our own prices on gold-filled items have gone up! Though the medals are now more expensive, they contain almost twice the amount of gold. Gold is always precious but pricey! We continue to offer it, since there is interest and call for it. Everyone can admit that gold makes a rosary or other gift very special, indeed. We still have some of the old 12KT gold-filled medals and crucifixes in stock. Rather than try to match these pieces to the new stock coming in, risking big color clashes on rosary orders, we have chosen to offer them to you at a discounted price. You might call it our first “close-out” sale! 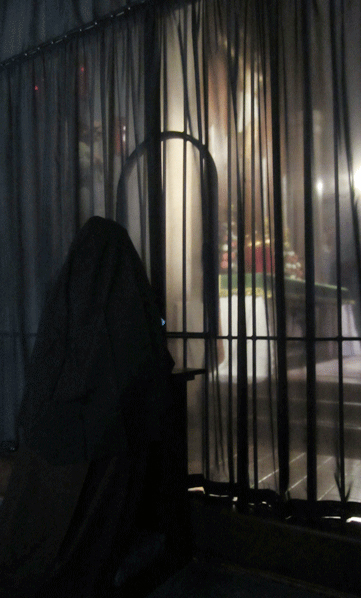 There is no better time to spend in prayerful reading than this season of Lent. A wide range of spiritual subjects is open to us – the Passion of Our Lord, of course, and subjects related to penance and progress in our spiritual life, etc. But for refectory reading this Lent, we as a Community are dividing the time between a book on the approach to penance and a book on Catholic history. This latter is Ten Dates Every Catholic Should Know, a fascinating and inspiring study of the “Divine surprises and chastisements that shaped the Church and changed the world.” The book merits our attention during this time of penance and prayer, giving us a vision of history – and of our own time – from the vantage point of Divine Providence. Author Diane Moczar states that secular historians analyze and record events, never suspecting or looking for the reasons or for the true, “transcendent meaning” in them. “Catholic historians, on the other hand,” she says, “see history as God acting in that world in which He became incarnate. In this He uses human instruments…” and often the events of history, including wars, economic shifts, natural disasters and other catastrophes “do appear to be fitting divine responses to moral evils.” As Christians who believe in a sovereign God who knows and sees all things, we read a small work like Moczar’s and learn a great deal – and learn to interpret even the events of daily life with a deeper outlook. Other reading the Sisters recommend from their personal experience of growth and enlightenment are the beautiful classics, Practice of the Presence of God, Spiritual Combat, and This Tremendous Lover. About Practice of the Presence of God, one Sister says, “It was the book that changed my whole thinking about prayer and living for God. I cannot express the encouragement it gave me. By reading it, I learned the importance of being simple before God and neighbor.” See all of our Lenten books for more good titles. 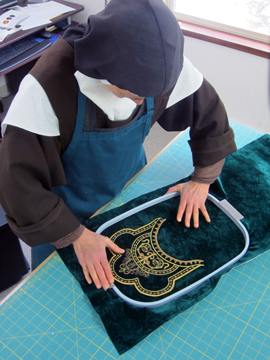 No one will be surprised that we undertook yet another big vestment set! 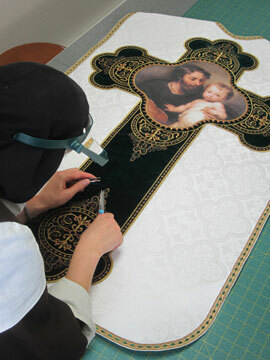 Yes, we value this privileged work, and this time our “labor of love” centered around St. Joseph. 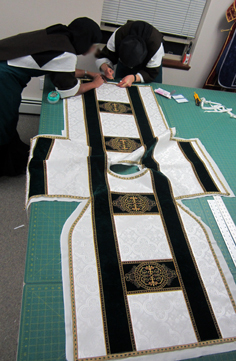 How pleased we all are – along with our good priests – to see these new vestments used for the first time on the upcoming Feast of St. Joseph, March 19th. 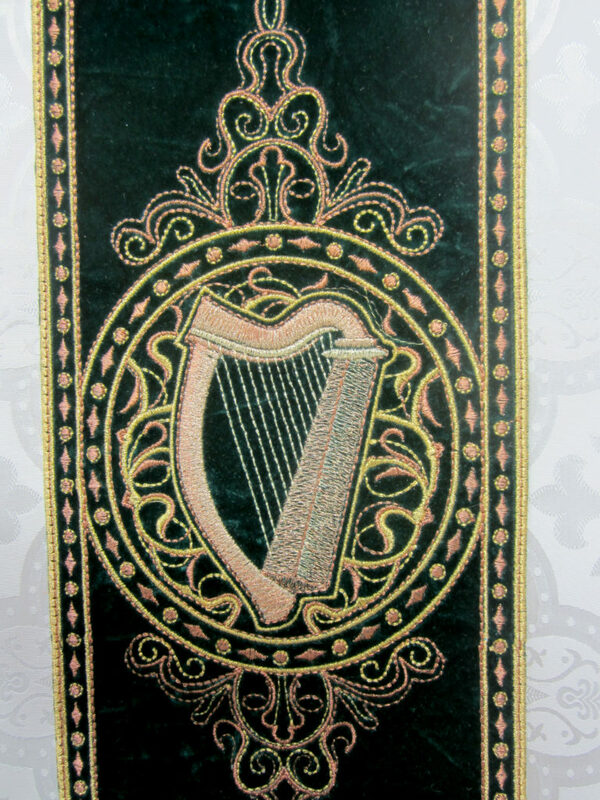 And what was our embroidery on this vestment? Symbols of St. Joseph: a carpenter’s square, of course; a thurible, or censer, with smoke of incense, signifying his continual worship of God; a crown and a harp, symbolizing his being of the House of King David; and the lily, sign of holy purity. 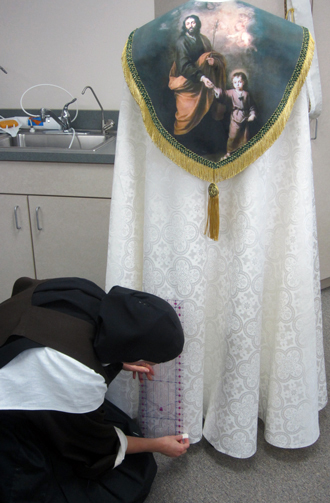 We managed to include every invocation from the Litany of St. Joseph on the various parts of the set, and near the end of the project, one of our priests had the brilliant idea of embroidering even the beautiful and profound prayer which completes this litany. 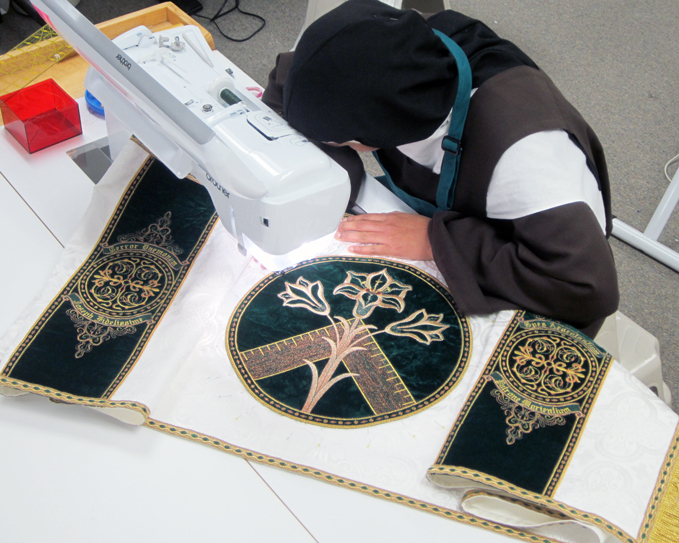 Since by this time, we had only the cope to finish, we were able to add this prayer into the lining of this final piece. Although we are well-rehearsed by now in many of the steps and procedure for such a project, still enough of the “Providentially-unexpected” arose to make some days rather daunting. 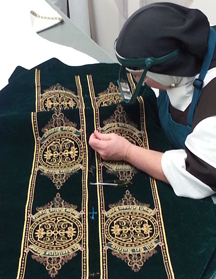 One of these surprises occurred when we were near completion of the antependium (altar frontal). To put it simply, it just didn’t look right! There was something missing – an imbalance of colors and contrast, and we needed just a bit more “presence” of the beautiful forest green that is throughout the design. Believe it or not, it came down to a simple trim to provide the needed accent of color. But to begin the hunt for the just the right thing at that late date! Truly, our good father, St. Joseph helped us in every challenge, and with the help of one of our “extern” friends, we actually found it locally, saving us precious time. Now that this project is completed, we are settling down to work on “safe” sewing, as one Sister likes to call it: our regular domestic mending and making for the needs of the Sisters. A slightly crooked seam matters not, and we rest easy to have less experienced sewing Sisters join us in the sewing room for this work. We are all staying healthy this winter – no colds, no flu. Our little monastery pharmacy, built up over many years, provides for most of our needs – the regular supplements and vitamins, along with a number of herbal remedies and tinctures. We are proof that home remedies usually are the answer “for what ails you!” And for this, we are grateful, especially as our winter actually gears up. We received a wonderful 9″ dump of snow in late February, and even today, as we write this letter, snow is falling lightly. Maybe we will at last really be out of the long drought. The mountain chickadees and other birds keep us entertained during these very cold days – the feeders are busy from dawn to dusk! 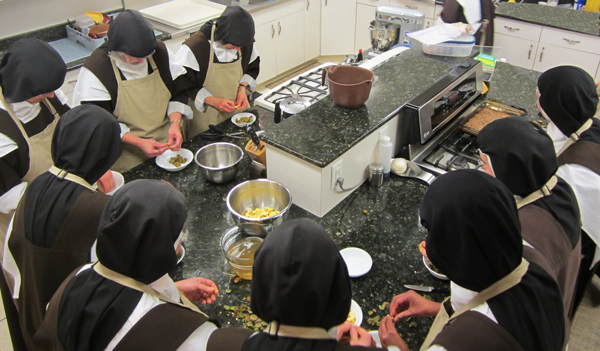 One little story about Lenten meals in Carmel will amuse you. In the Carmelite’s never-ending search for nutritious, high-protein foods, we have discovered two rather humble items: buckwheat and fava beans. Buckwheat boasts 23 grams of protein per serving, with a high concentration of all the essential amino acids – with a good amount of fiber, too. It’s great for porridge, thickening soups and baking. A healthy serving of fava beans offers a generous 26 grams of protein and is high in all the vitamin Bs – again with good fiber content. But when we finally tried the fava beans (purchasing a 25-lb sack of them! ), we discovered that they demand a good deal of work to prepare them for consumption of all that nutrition: they must be peeled. No two fava beans are exactly alike, and therefore, we have tried (and continue to try) all sorts of methods and tools to accomplish our peeling mission. Mother Prioress will not leave this work to Sister Cook alone. No, all must contribute brawn and brain to get the crazy things peeled. So, every once in a while (more often during Lent), after midday dinner cleanup, we gather around the kitchen island, every Sister with a bowl, and we PEEL. Some peels surprise us and slip right off, popping the bean straight up into the air; others stubbornly adhere to their bean and it’s a fight. But we all look forward to the fruit of our labors: a steaming bowl of spicy fava bean soup, loaded with the God-given nourishment we need to live another day of prayer and sacrifice in Carmel for the love of God and the salvation of souls. Deo gratias for fava beans! 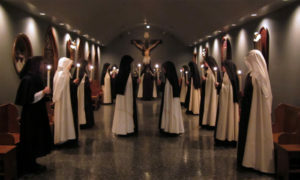 Several young ladies are currently corresponding with us about possible vocations to our Monastery, and as ever, we ask your prayers for these good and generous souls seeking God’s will. Know of our prayers for you and with you this holy Lent. As the “ancient serpent,” our enemy, the devil, witnesses all of us striving for purity and perfection in God’s love, we will often feel our weakness. But following the paternal counsel of St. Paul (2 Cor. 6), let us conduct ourselves as true servants of God, in much patience, in long-suffering, sincere charity, sweetness of temper; in fasting, prayer and alms-giving throughout these holy days. And by God’s own power and His armor of justice upon us, we will overcome the Old Tempter – and win many silent, hidden victories for our own souls, and those of others who so greatly need our prayers. We adore Your Cross, O Lord, and we praise and glorify Your holy resurrection: for behold, by the wood of the Cross joy came into the whole world. P. S. March 28 is the 500th anniversary of the birth of St. Teresa of Avila, she whom we call our Holy Mother. A Mass will be offered in her honor here at our monastery chapel.